Dudleya lanceolata mostly grows on north slopes and in the nearby shade of shrubs. The Lance Leaf Live Forever prefers strong indirect light most of the day. Dudleya lanceolata will tolerate heavy soils if there is no summer irrigation. 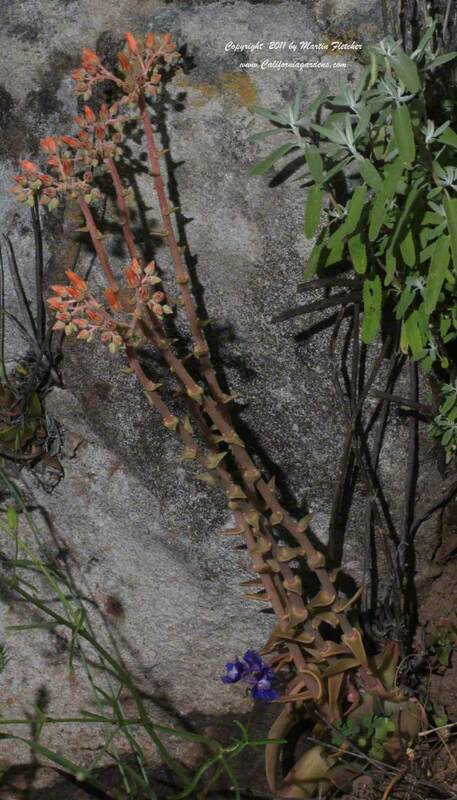 The foliage of Dudleya lanceolata varies from green to a reddish hue and grows to 6" tall, the flower spike grows from 1-2 feet tall producing blooms from late Spring into Summer. Dudleya lanceolata is Winter hardy into the low teens. Flowers and foliage of Dudleya lanceolata - Lance Leaf Live Forever. High resolution photos are part of our garden image collection.